Rub - A - Dub, 3 Pups in a Tub! 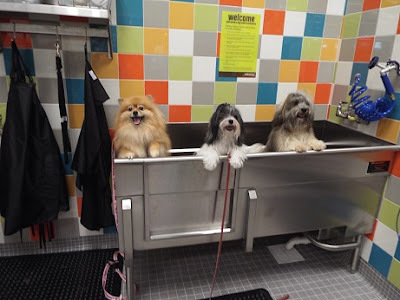 Pepper, Zoe, and Rocco checked out the bathing area at the new Unleashed by Petco store in Atlanta, GA. If you live in the area, they are having a Grand Opening pawty this weekend Sept 7 & 8, 2013. Please phone the store for the exact time & details 404-351-5591. Note: Thank you Petco for permission to post this photo. BOL!!! That is a pawesome photo, Pepper! You all look like you were having a great time (and I imagine it is because you were actually NOT getting a bath). hehe - you are all so cute. Awww super cute photo! Happy BlogPaws Wordless Wednesday! So cute! So who's the one that gets to bathe them all? BOL!!! We weren't bathed that day, we had all been bathed/groomed recently. Rocco and Zoe did have to dry their paws though. My paws have shorter fur than Havanese paws, so they weren't very wet. Some of us were supposed to get baths today, but that didn't happen...and Teri has a working interview tomorrow...but we hear that Coco and Brighton will get bathed tomorrow night in preparation for the cat show this weekend! that is the CUTEST photo EVER!! Thank you! :) I am so glad I am allowed to post/share it. I think Mom took 20 photos before she captured one with all 3 pups standing up at the same time. BOL!! Oh, I LOVES that pic!!! You guys look FABulous! Looks like fun bath time. Did you have fun Pepper or was it too crowded in there for you? BOL!! The tub was huge, so it wasn't overcrowded. :) I had fun because I didn't actually get a bath! BOL!!! I got a treat instead. Photos = treat in my world. OMD! What a cute photo! Cute picture! When you get a chance, can you email me quick? I've got a question regarding National Dog Week.